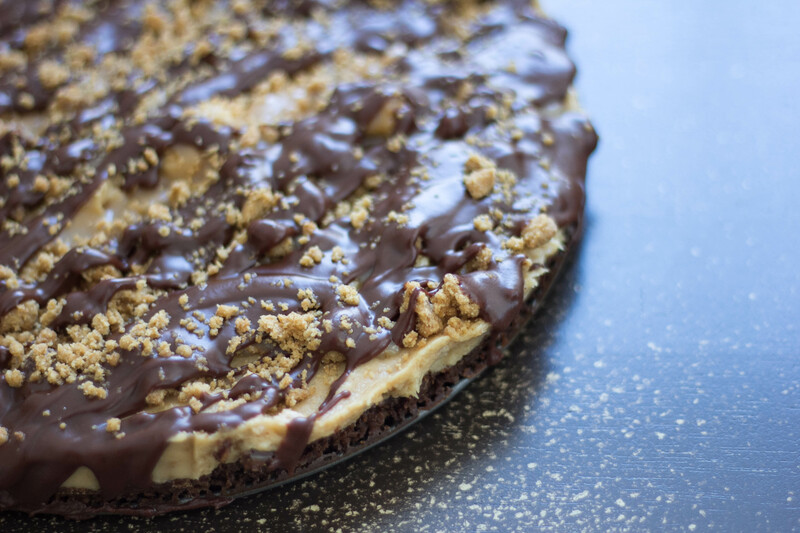 Chocolate Peanut Butter Cookie Dough Crumble Pie. AKA: The Mouthful. Along with individual names, bedrooms, and godparents, when my sister and I were growing up we were also assigned individual birthday cakes. I’m not sure how it happened. I don’t remember a point at which we were presented with specific options and instructed to choose, but I know that somehow over the years evolved a staunch tradition that on our birthdays, our mother would make each one of us our “very own” cake creation. Mine has been, and always will be a beguiling concoction of ice cream, brownie, and Cool Whip layered to perfection in a springform pan. For my sister, it was the Chocolate Chip Cookie Cake, which is a lot like it sounds – a spongy, whimsical bundt cake with chocolate chips that resembled giant cookie wreath. The custom was always a comforting annual favorite for me; in addition to balloons and presents, I had my special cake to anticipate! This year however, for circumstantial reasons, I found myself taking a crack at creating a dessert that would commemorate the latest change in my sister’s age. I didn’t dare attempt to fill my mother’s bundt pan with a cake that I knew I couldn’t do proper justice, so I apprehensively decided I’d whip up something new. She has recently become a mother, so I thought it’d be a good time to give birth to some new traditions (see what I did there?). Rummaging through my recollection of shared childhood snacks, I remembered that the classic collaboration between chocolate and peanut butter was always a hit for her. Whether it came in the form of cookies, ice cream, or cake, we clamored for anything that came in creamy-salty-sweet and were always on alert for that signature Reese’s orange. Yes, that would definitely be the path to pursue. Ok. Flavor profile established. My ice cream maker is in storage due to a recent move, so that’s out. What else could I come up with? I wanted something that I can stick some candles in, and I was looking to add as many of her favorite things as possible. I started with a list: chocolate, peanut butter, caramel, cookie dough. I went shopping with those items bouncing around my brain, and this is what I wound up with – The Mouthful. Named as much for the amount of ingredients as it is for the fact that a mouthful is what you’ll be repeatedly reaching for while you’re enjoying this crazy thing. 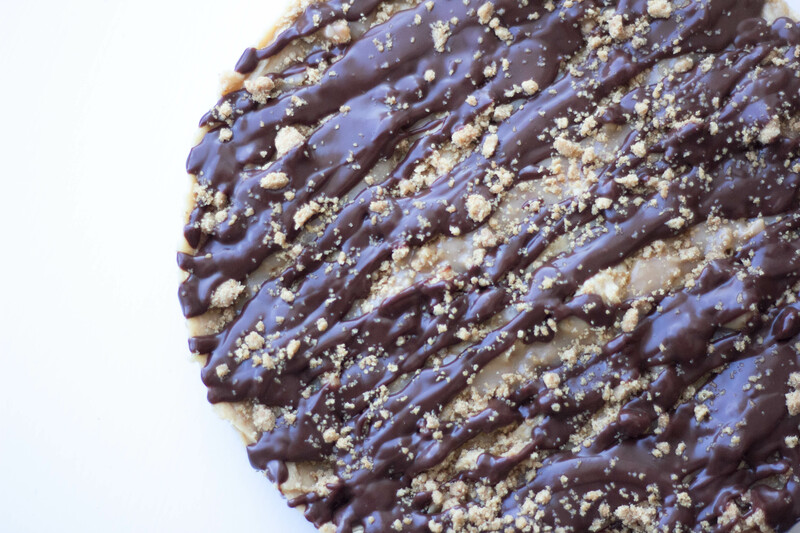 And otherwise, we’d have to call it something like Chocolate Peanut Butter Salted Caramel Cocoa Pebble Cookie Dough Crumble Pie. Like I said – it’s a Mouthful. For the crust of the pie, I wanted real crunch and I didn’t want to sacrifice any opportunity to infuse chocolate or peanut butter. I grabbed a box of Cocoa Pebbles, crushed them up and added some peanut butter and baked it off. Crust accomplished. I layered on some homemade salted caramel for contrast and to give it a goo factor, and then mixed up what would be the filling: a mixture of peanut butter, cream cheese, and powdered sugar to which I gently folded in a bit of whipped cream, freshly made on the fly. I opted to leave the cream unsweetened, for fear that I might overdo the sugar factor in the overall dessert. 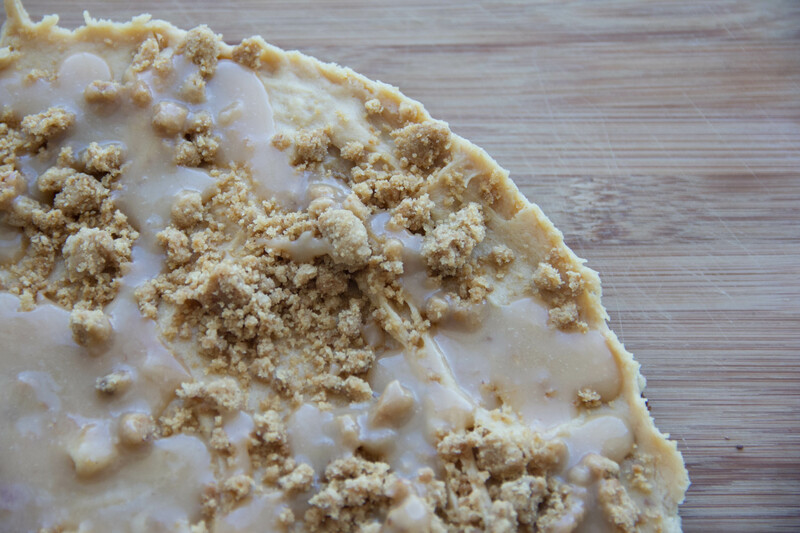 Originally, I had wanted to make peanut butter cookie dough chunks which would decorate the top of the pie. 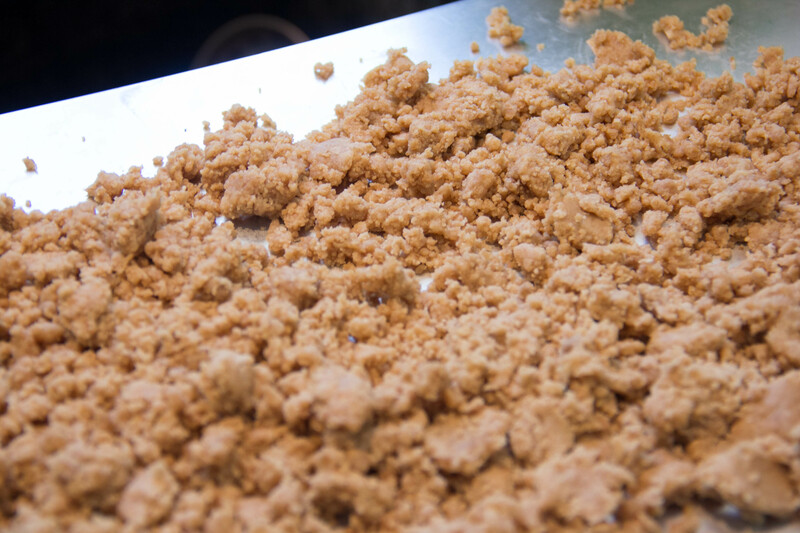 For texture, I changed my mind and instead created the crisp, lightly baked peanut butter cookie dough crumble. Instead of just topping the pie, I worked it into the filling and spread it on before adding another floor of salted caramel. 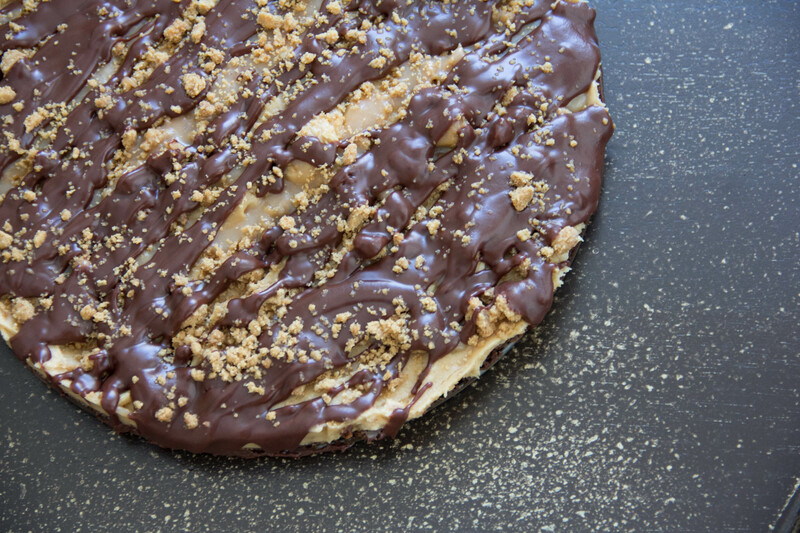 Once the layers were stacked (Cocoa Pebbles crust, salted caramel, peanut butter-cream cheese and crumble filling, salted caramel, cookie dough crumble), I chopped up a Ghirardelli bittersweet bar for a drizzle-worthy chocolate-peanut butter ganache. Here’s a shot of the naked pie, pre-ganache attack. The result falls somewhere between a cake and a pie, and is absolutely packed with PB & C. No component was left behind in the quest to address my sister’s love of peanut butter and chocolate. Did I overcompensate? Maybe a little. But I’m thinking my niece may need a signature birthday cake someday, and I just may be in the running to provide such a thing. Here’s the rundown in case you ever find yourself in a position to assign someone a birthday cake. Or just in case you’re in desperate need of a chocolate-peanut butter blow to the head. 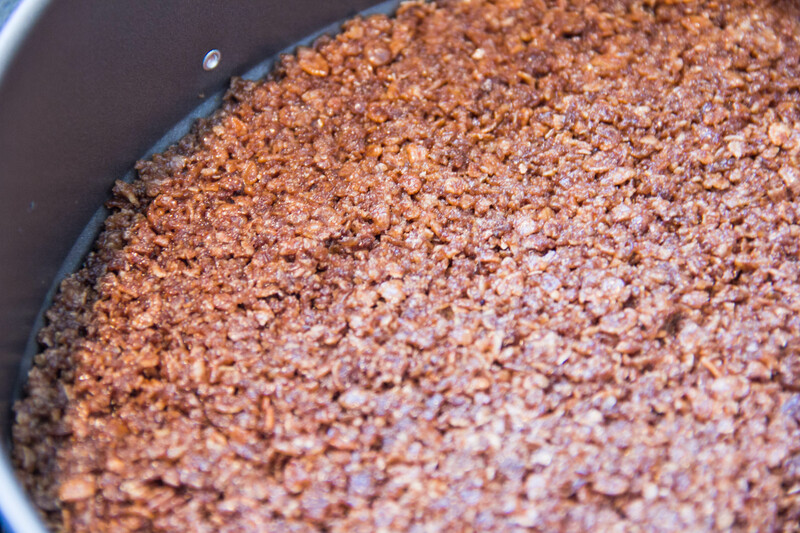 6 Cups Cocoa Pebbles Cereal, crushed. You can use a blender or food processor or even a rolling pin, but I prefer to just get in there and use my two hands. Playing with food is the best. Combine the ingredients until well integrated. Press the mixture into a 9 inch springform pan and bake for 10 min at 350. Cook the sugar until deep brown. Slowly stir in the heavy cream very carefully as the combination will boil up like an angry volcano! Add vanilla, butter, and salt, while stirring and allow the mixture to cool. If it is too thick to spread, add 1/4 cup water to thin out the sauce. For the purposes of this cake, you want it to be spreadable but not runny. Using a hand mixer (if you’ve got one. 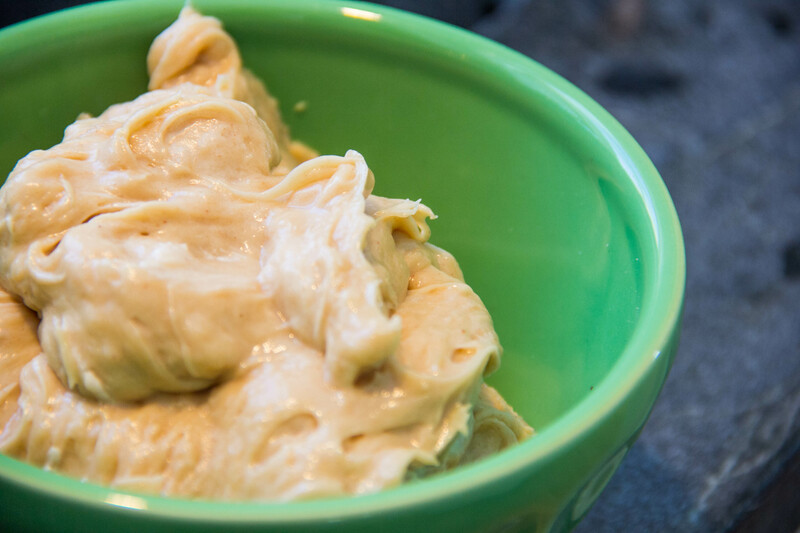 If not, then “Using elbow grease”) cream together the sugar, cream cheese, and PB. Gently fold in your whipped cream until light and fluffy. Cream together the sugar, brown sugar, butter, peanut butter and salt, then slowly begin adding the flour until mixed well. Spread the crumbly mixture on a baking sheet and pop it in the over for 12 – 15 minutes at 350, or until it has a nice firm texture. About halfway through the baking time, turn the mixture through with a spatula, allowing it to crisp evenly. Heat the heavy cream over medium heat until simmering, and then pour over the chopped chocolate and peanut butter. Stir carefully until mixed well. Once you have your components, it’s just a layering job. I took my time and popped the whole pie in the freezer in between layers to help each one set; this helps to keep the sections separate. Spread a layer of salted caramel sauce over the crust, saving half for a later layer. Mix about 1/4 of your cookie dough crumble into the filling, making sure it’s evenly distributed, and spread it over the caramel layer. Then pour on the remaining caramel and sprinkle the remaining crumble. 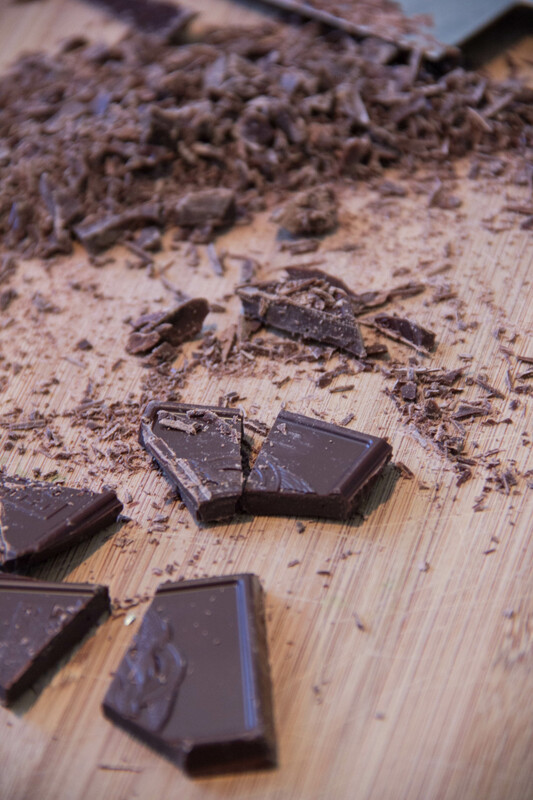 Finally, drizzle your ganache over the top. I did not say it was quick or easy – I just said that it was delicious!! This baby keeps best in the fridge or freezer, due to the fluffy, creamy filling and ganache. Serve with additional whipped cream or just by its beautiful self! oh every layer of this is so decadent!